Stunning yet simple, Stretch Tents have become the affordable and aesthetic alternative to traditional marquees. 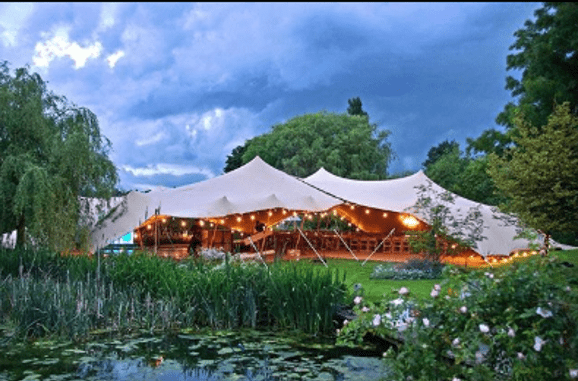 With their distinctive free flowing contours, a Stretch Tent provides the perfect setting for any event, from a simple garden party to a large festival or show. Every Stretch Tent is built differently for your event, ensuring a bespoke organic structure for maximum impact on guests or clients. Due to their unique design, based loosely on the classic Bedouin style of tent, Stretch Tents can be constructed to fit in and around any environment seamlessly, making them a far more practical and flexible solution than traditional marquees. Suitable for use all year around and completely waterproof, Stretch Tents can be set up to create either an open and breezy space or a fully enclosed and intimate setting, depending on the season.